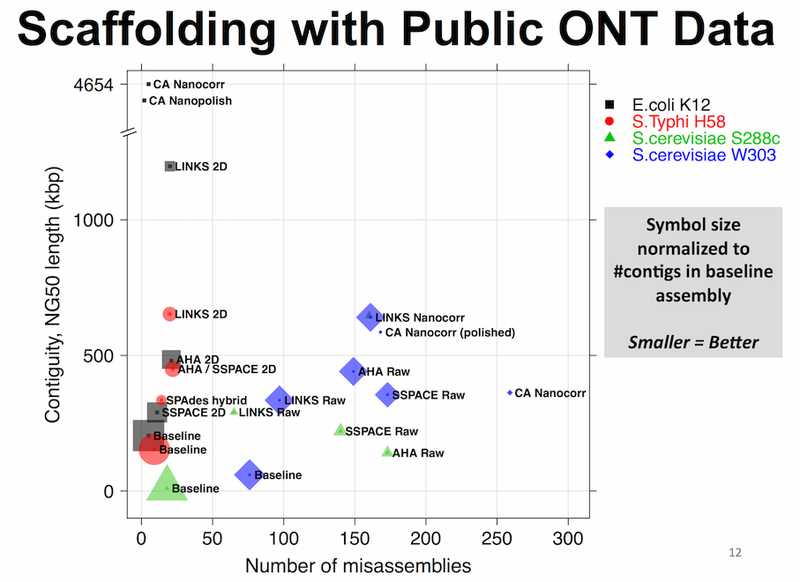 LINKS is a scalable genomics application for scaffolding or re-scaffolding genome assembly drafts with long reads, such as those produced by Oxford Nanopore Technologies Ltd and Pacific Biosciences. It provides a generic alignment-free framework for scaffolding and can work on any sequences. It is versatile and supports not only long sequences as a source of long-range information, but also MPET pairs and linked-reads, such as those from the 10x Genomics GemCode and Chromium platform, via ARCS (http://www.bcgsc.ca/platform/bioinfo/software/arcs) or ARKS (https://github.com/bcgsc/arks/). Fill gaps in LINKS-derived scaffolds using Sealer (http://www.bcgsc.ca/platform/bioinfo/software/sealer) or cobbler (https://github.com/bcgsc/rails/). (top) LINKS performance for scaffolding high-quality Illumina assemblies using Oxford Nanopore Technologies long reads (F2D: Full 2 Dimension, R7 or R7.3 chemistry) compared to other scaffolders (SSPACE-LR, AHA) developed for Pacific Biosciences sequence data. 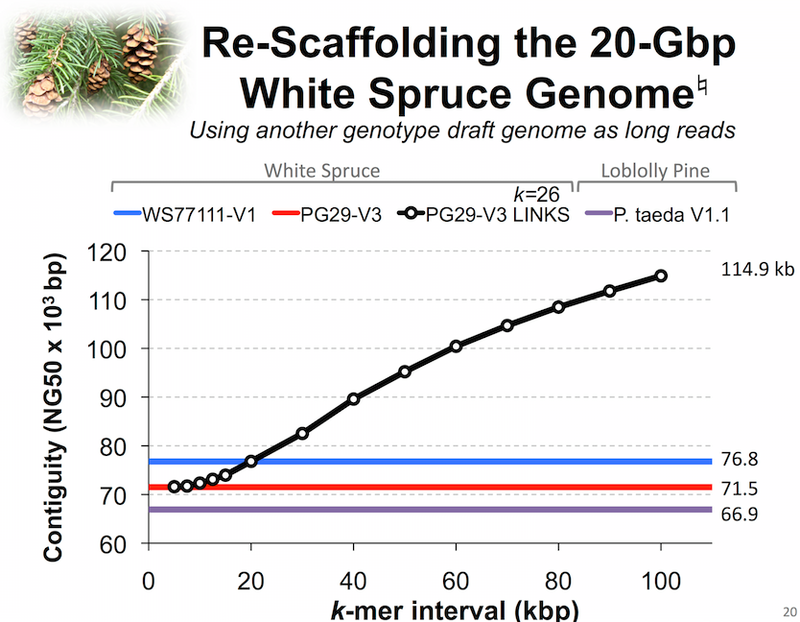 (top) LINKS-rescaffolded white spruce (PG29-V3, 20 Gbp) genome draft using the draft assembly of another colossal 20 Gbp white spruce genotype (WS77111-V1) draft genome assembly. The merges were validated by gap-filling and MPET read alignment. Additional information about LINKS is found in the readme file provided in the latest release, the BioRxiv manuscript and in this poster. Use v1.8.5 if running LINKS to scaffold with long reads*. When pipelined with ARCS, LINKS v1.8.6 prioritizes paths with shorter gaps only when there are no ambiguous gap distance estimates with neighboring sequences.